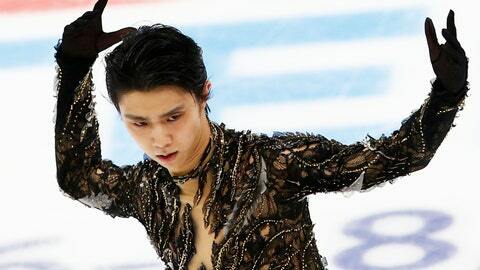 TOKYO (AP) — Two-time Olympic champion Yuzuru Hanyu of Japan will miss the Grand Prix of Figure Skating Final due to a right ankle injury, the Japan Skating Federation said Thursday. The 23-year-old Hanyu twisted his right ankle during a practice at the Rostelecom Cup on Nov. 17, and will be unable to compete in the Dec. 6-8 GP Final in Vancouver, Canada. Hanyu’s withdrawal means Shoma Uno will be the lone Japanese male taking part. In addition to winning back-to-back Olympic golds and world championships, Hanyu won the Grand Prix Final four consecutive times between 2013 and 2016. He was aiming to become the first skater, male or female, to win five GP titles overall. The GP Final features the top six skaters from the International Skating Union’s Grand Prix series. Hanyu qualified by winning the Grand Prix of Helsinki and the Rostelecom Cup.